In the recovery of oil from oil bearing reservoirs, it usually is possible to recover only minor portions of the original oil in place by the so-called primary recovery methods which utilize only the natural forces present in the reservoir. Thus, a variety of supplemental recovery techniques have been employed in order to increase the recovery of oil from subterranean reservoirs. These supplemental techniques, commonly referred to as “enhanced oil recovery,” involve the injection of afluid, or series of fluids, into the reservoir through an injection system comprised of one or more wells. As the injected fluid moves through the reservoir, it acts to displace the oil therein, to a production system composed of one or more wellsthrough which the oil is recovered. One type of enhanced oil recovery procedure involves miscible flooding in which an oil miscible solvent is injected into the formation. The solvent is forced through the formation by a suitable driving fluid, whichmay be gaseous or liquid depending upon the nature of the solvent, and acts to displace the oil to the production system. The miscible displacement mechanism may involve “first contact miscibility” or “conditional miscibility“. In first contactmiscibility, the miscible displacing agent normally takes the form of a light hydrocarbon slug such as pentane, propane or butane, or mixtures of such hydrocarbons, commonly termed “liquified petroleum gas” (LPG). The injected liquid hydrocarbon iscapable of forming a single phase with the reservoir oil at the reservoir conditions immediately upon contact therewith. In conditional miscibility, a miscible transition zone is formed in the reservoir as a result of repeated contact of the reservoiroil by an injected high pressure gas. The transition zone of conditional miscibility may be formed of light hydrocarbons from an injected enriched gas, or light hydrocarbons may be stripped from the reservoir oil by an injected lean gas. The carbon dioxide may be employed alone or inconjunction with other materials to establish a conditionally miscible transition zone within the reservoir. Various so-called inert gases may be employed to establish oil displacement by conditional miscibility. A miscible oil displacement process involves the injection of high pressure nitrogen. The pure nitrogen is injected into the reservoir and functions to initially strip relatively low molecular weight hydrocarbonsfrom the reservoir oil. As the light hydrocarbons are absorbed, a two-phase equilibrium point is established between the reservoir oil and the nitrogen at a location near the injection well. The liquid phase is composed initially of significantquantities of light and heavy residual hydrocarbons, whereas the gas phase is comprised primarily of nitrogen and light hydrocarbons. Since the gas phase has a higher mobility within the reservoir, it moves ahead of the liquid phase to contactadditional reservoir oil. As nitrogen injection continues, the liquid phase is contacted with additional nitrogen with an attendant decrease in the concentration of light hydrocarbons in the liquid phase until ultimately the liquid phase is reduced tothe heavy residual hydrocarbons. Nitrogen and carbon dioxide may also be employed in admixture with one another or with other gases. Examples of inert gases which may be employed in the process includes methane, natural gas, separator gas, flue gas, nitrogen and air. As part of the procedure, an initial hydrocarbon slug is injected into the reservoir via a suitable injection system. Thus, a mixture of the light hydrocarbon and reservoir oil is formulated adjacent the injection system. Subsequent to injection of the light hydrocarbon slug, a predominantly nitrogen-containing gas is introducedinto the reservoir via the injection system. The nitrogen containing gas is injected at a rate to produce a flow velocity within the formation which is less than the velocity of the previously injected light hydrocarbon. The injection of thepredominantly nitrogen-containing gas is continued at this relatively low rate and in amounts sufficient to strip the previously injected light hydrocarbon from the reservoir oil and form a transition zone of conditional miscibility within the reservoir. The process is carried to conclusion by the injection of a gaseous driving fluid into the reservoir to displace the oil therein to a suitable production system from which it is recovered. As noted previously, the injection of nitrogen gas can, under appropriate circumstances, result in the establishment of a miscible transition from the reservoir oil. In order for the injected nitrogen to become sufficiently rich with therelatively low molecular weight hydrocarbons to establish miscibility, a number of successive contacts of the enriched nitrogen and the reservoir oil must occur. The movement of the gas and liquid phases through the reservoir may be characterized asinvolving a chromatographic transport mechanism which produces gas-liquid chromatographic separation in the reservoir sand. The stripping of light to intermediate hydrocarbons from the reservoir oil with the attendant enrichment of the injected nitrogenmay be defined in terms of this chromatographic separation effect. Thus, the enrichment of the injected nitrogen can be related to the number of theoretical plates required for the attainment of gas-liquid equilibrium. By analogizing the reservoir sandto a packed column, the equivalent length of reservoir sand required for the attainment of gas-liquid equilibrium may be explained in terms of the “height equivalent to a theoretical plate” (HETP), familiar to those skilled in the art of liquid-vaporfractionation. The HETP is a function of the reservoir characteristics and is constant for a given reservoir. The number of equilibrium contacts between the gas and the reservoir oil multiplied by the HETP gives the length of the fluid flow path withinthe reservoir needed to establish sufficient enrichment of the injected nitrogen to produce the in situ transition zone which is miscible in both the gas phase and the reservoir oil. The length of this path at pressures and temperatures normally encountered in subterranean reservoirs is much longer for nitrogen than for carbon dioxide. For example, for a typical reservoir oil having a stock tank API gravity of 35.6° at a temperature of 164° F. and 3334 psia, the path lengthneeded to achieve a conditionally miscible state through the injection of pure carbon dioxide would be about 4-5 feet. Where nitrogen, rather than carbon dioxide is employed as the injection gas, the path length needed to establish a conditionallymiscible transition zone adjacent the injection system is increased materially to a value on the order of 100 feet or more. The reservoir oil in the immediate vicinity of the injection system is altered in a manner to enhance the enrichment process leading to formation of the conditionally miscible transition zone. Increasingthe quantity of C2 -C6 hydrocarbons, ethane, propane, butane, pentane, hexane and mixtures thereof, in the reservoir oil adjacent the injection well decreases the minimum pressure required to achieve miscibility at the reservoir temperature; orat a given set of reservoir conditions of pressure and temperature, reduces the path length necessary to establish the conditionally miscible transition zone. The initial light hydrocarbon slug is injected at a relatively high rate sufficient to causefingering of the light hydrocarbon through the reservoir oil. Stated otherwise, the light hydrocarbon slug is injected under conditions producing a high flow velocity which results in inefficient displacement of the reservoir oil. The resultant mixingof the light hydrocarbon with the reservoir oil alters the liquid adjacent the injection well so that miscibility is obtained within a relatively short path length. For example, at the reservoir conditions of 164° F. and 3334 psia noted above,injection of an LPG slug into a 10-acre pattern to modify the reservoir oil within a radius of 15-40 feet from the injection well can reduce this path length to a value of about 4-5 feet. The initially-injected light hydrocarbon may take the form of anysuitable hydrocarbon or mixtures thereof, which exhibit a relatively low molecular weight. Thus, suitable hydrocarbons would include low to intermediate molecular weight alkanes such as ethane ranging up to hexane. Where a mixture of hydrocarbons isemployed, as will normally be the case, the average molecular weight of the mixture usually will be in the C3 -C4 range, i.e. an average molecular weight of about 40-60. Of course, other aliphatic hydrocarbons having similar molecular weightsand liquid-vapor phase characteristics may also be employed. The light hydrocarbon slug may be injected at any suitable rate sufficient to produce the desired mixing zone adjacent the injection system. While the flow velocity of the injected fluid within the formation will depend to some extent upon thegravity characteristics of the reservoir, it usually will be desirable to inject the light hydrocarbon slug at a rate sufficient to produce a darcy velocity (apparent velocity) at the light hycrocarbon slug front of at least 2 feet per day. After the injection of a suitable quantity of the light hydrocarbon, nitrogen is injected in order to establish the transition zone of conditional miscibility adjacent the injection wells. The nitrogen is injected at a rate which produces adarcy velocity less than the velocity of the previously injected light hydrocarbon. Any suitable predominantly nitrogen-containing gas may be employed at this stage of the invention. For example, the injected gas may take the form of substantially purenitrogen such as produced by cryogenic fractionation of air. The nitrogen containing gas may also take the form of fluegases such as from boilers or internal combustion engines which typically will contain about 88% nitrogen, 10% carbon dioxide, 1% carbon monoxide, and the remainder hydrogen and trace amounts of other gases. As noted previously, the predominantly nitrogen-containing gas is injected at a rate to produce a flow velocity within the formation which is less than the velocity of the previously injected light hydrocarbon slug. The injection of nitrogen iscontinued at a sufficiently low rate to maintain the transition zone of conditional miscibility formed between the nitrogen and the altered reservoir fluid as it is moved through the reservoir and displaces the oil therein. Usually it will be preferredto inject the nitrogenous gas at a rate resulting in a flow velocity within the reservoir within the range of 0.1-1.0 feet per day. 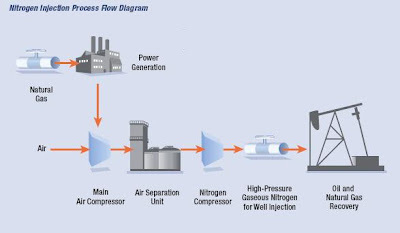 The nitrogenous gas is injected into the reservoir in an amount sufficient to maintain and propel the transition zone of conditional miscibility through the reservoir to the production system. Preferably, the nitrogenous gas is injected in anamount of at least 0.2-0.4 pore volume and is then followed by a suitable driving fluid which may simply comprise continued injection of the nitrogenous gas or may take the form of some other suitable gas which is compatible with the reservoir oil andthe previously injected fluids. While the process usually will be carried out employing only gas injection, in some instances, a liquid such as water may be employed as part of the driving agent. For example, water may be employed to increase the arealsweep efficiency of the process in the manner of the AGWIP (alternate gas-water injection procedure) technique known to those skilled in the art, or water thickened with a suitable polymeric thicknening agent may be injected for mobility controlpurposes. This procedure may be carried out in an essentially flat reservoir where the oil displacement is fundamentally horizontal. However, a preferred application of the present is in reservoirs having a pronounced dip, i.e. 10° or more, where the gravitational effects due to the density differentials of the various fluids involved may be utilized to advantage. In this case, the light hydrocarbon and nitrogen are injected through one or more wells located up dip from theproduction wells.